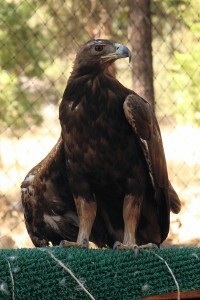 Draco was an immature Golden Eagle when he came to Badger Run in 2011. He came from near the Klamath Falls fish hatchery, and had a dislocated shoulder. Unlike mammals, birds do not have a nice “ball and socket” joint in their shoulder, but rather a “depression” in the scapula that the wing bone (humerus) sits in. So, it must be wrapped tightly, to prevent any movement, so the tendons, muscles and ligaments can again tighten up to hold the wing in place. Despite our best wraps, he was so strong, that he managed to move it just enough to prevent shortening and tightening of those tissues, rendering him flightless. He now lives in our Eagle Pen in the Public Education Area, where he “rules the roost”, always picking the “best morsel” from the food offered for the day. He also suffered some brain damage (he was probably hit by a vehicle), and is not nearly as afraid or reactive around people as would be normal. Call us for a tour so you can come meet this wonderful addition to our Animal Ambassadors.